It makes a difference. When you see an open coaxial connector, think of it as a light you left on or a water spigot left running. It may not seem like it, but an open coaxial connection is really the same thing, just on a smaller scale. We all know that you should use the smallest possible splitter, because the signal strength through every port is lower even if you don’t use the extra lines. It’s hard to resist the temptation to “set it and forget it” by wiring every room in the house, but you really should resist. The unused lines add loss to the whole system and can especially impact MoCA networking, which is used by both DIRECTV and DISH. If you absolutely must have an unused connection, whether it’s a port on a splitter or a long unused run of cable, you really need to terminate. Terminators. You don’t need to buy expensive ones. In fact the ones from the local home store will do just fine. However, if you are using cheaper ones, run a quick test by screwing them on and unscrewing them then looking at the center pin. Some of the cheap ones fall apart the first time you use them. 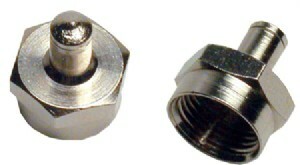 Barrel connectors. Again, you don’t need to buy expensive ones. You will not actually be passing a satellite signal through them, but since terminators only come in “male,” you’ll need to attach one of these to any cable you have laying around in order to terminate it. 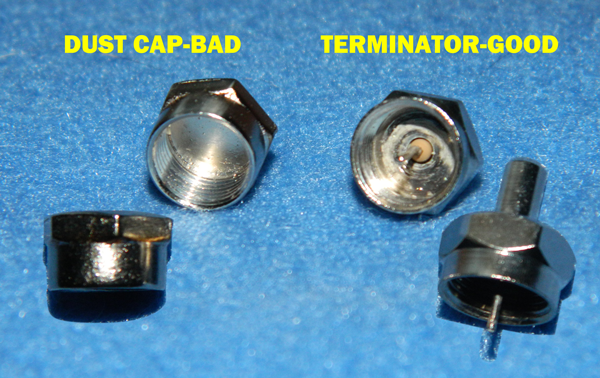 It’s important to note the difference between a terminator and a dust cap. A dust cap is just a piece of metal that keeps dust out of a connection. It doesn’t do anything and is useless in preventing signal loss. The easiest way to tell a dust cap is that it has no center connector. A terminator is actually an active piece of electronics that forms a proper endpoint for a signal. Unlike water or light, the signal through a coaxial cable is always traveling two ways… just like any electrical signal. Electrical plugs have two or three prongs for that reason. If you leave a line unterminated, you destroy the balance between the signal and return legs, and that can cause problems. The answer is that your cable or satellite receiver is a very powerful instrument and it can work through most forms of interference. The amount of electricity through most cables is less than one microvolt in many cases and yet you get a great signal. However, as signals get more and more complex, carrying hundreds of HD channels as well as computer networking… eventually it becomes important to have the best possible quality down the line. So, spend a little money, terminate those connections, and everything will work better!